You Dometios, as a dwelling-place of grace. 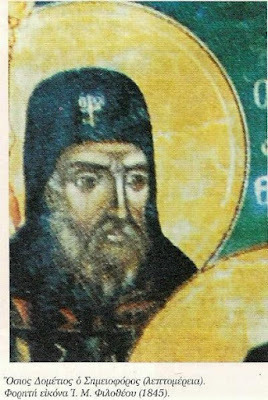 Our Venerable Father Dometios was an ascetic in the mountains near Philotheou Monastery at the Holy Mountain of Athos in the sixteenth century. We read about him in the New Martyrology of Saint Nikodemos the Hagiorite, where we are told that the Holy New Martyr Damianos (Feb. 14), after leaving Philotheou Monastery, went to live under obedience to Saint Dometios, who is called a "Sign-bearer", for a period of three years. There they lived together in constant prayer, fasting, vigils and hardwork, perfecting the virtues. Saint Damianos went on after three years to preach the word of God in the villages surrounding Mount Olympus, and suffered martyrdom by the Turks in 1568. Saint Dometios reposed in peace at Mount Athos.